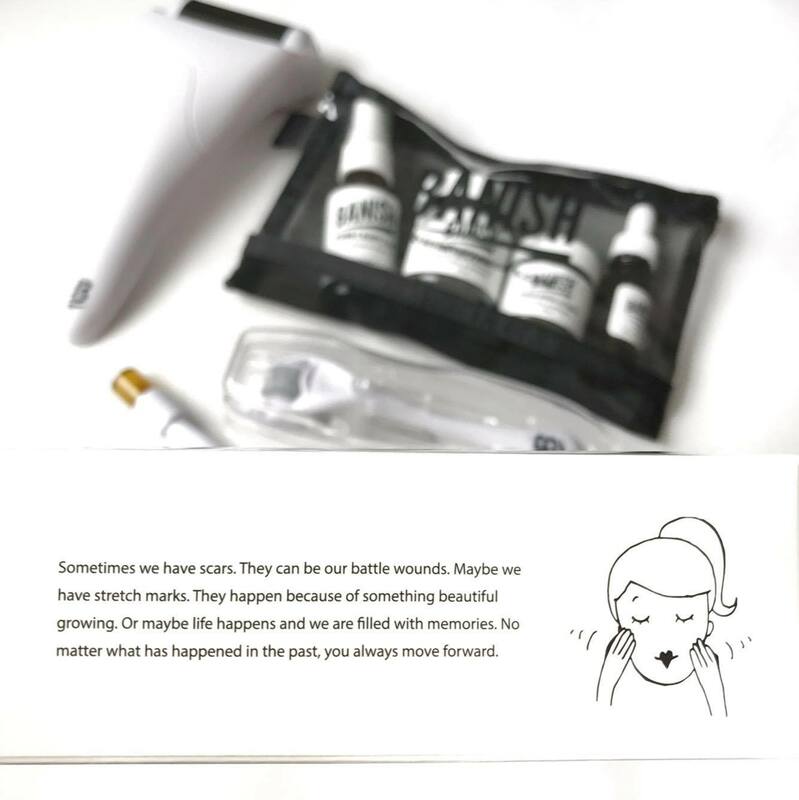 A month and a half ago I received my Banish Acne Scar kit from the lovely Ana. 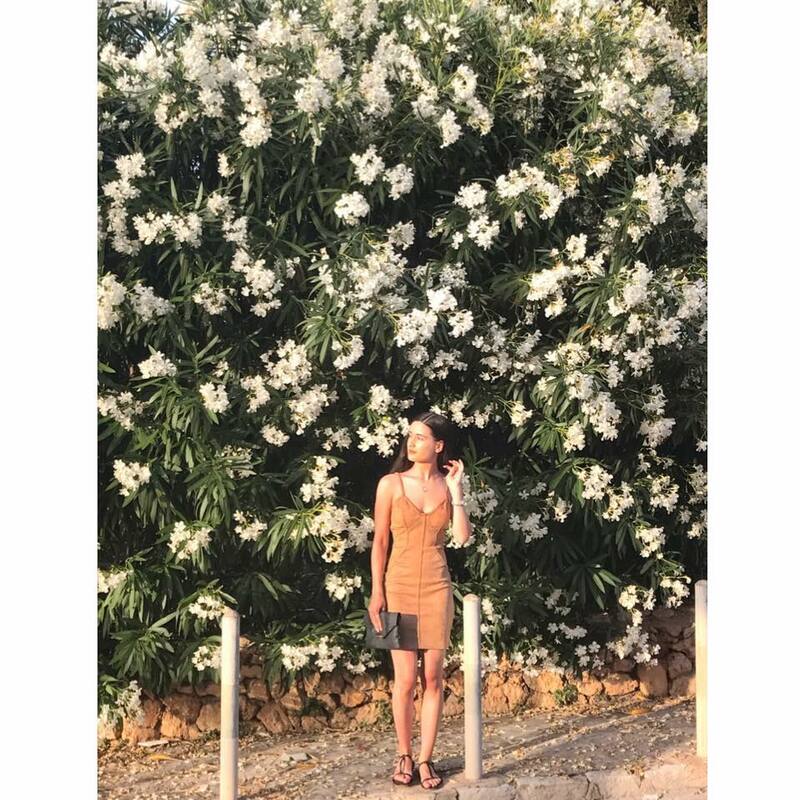 From previous posts I have highlighted the struggle I've had with my skin over the past year and some of the methods I have used to try and control my breakouts. Although my skin has mostly cleared, with only few breakouts here and there, I have been left with some scaring. My skin is very delicate and any cut, spot or scrape does tend to leave a mark. 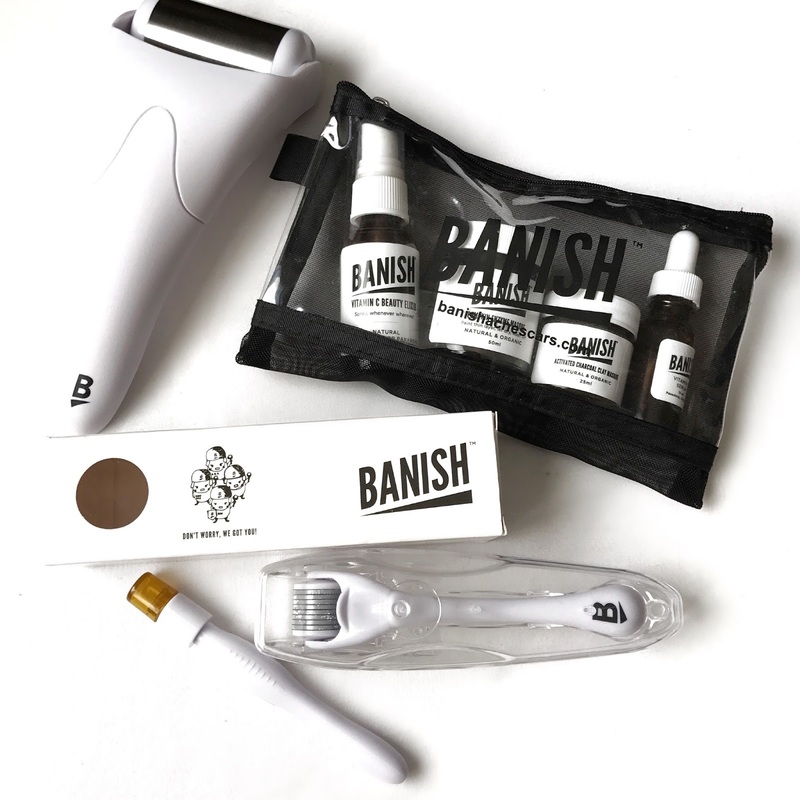 My aim now is to get my skin in the best condition and I've had a great kick start with the banish starter kit! The first thing I was eager to try were the two derma rollers, a medium banisher and a small pen banisher. 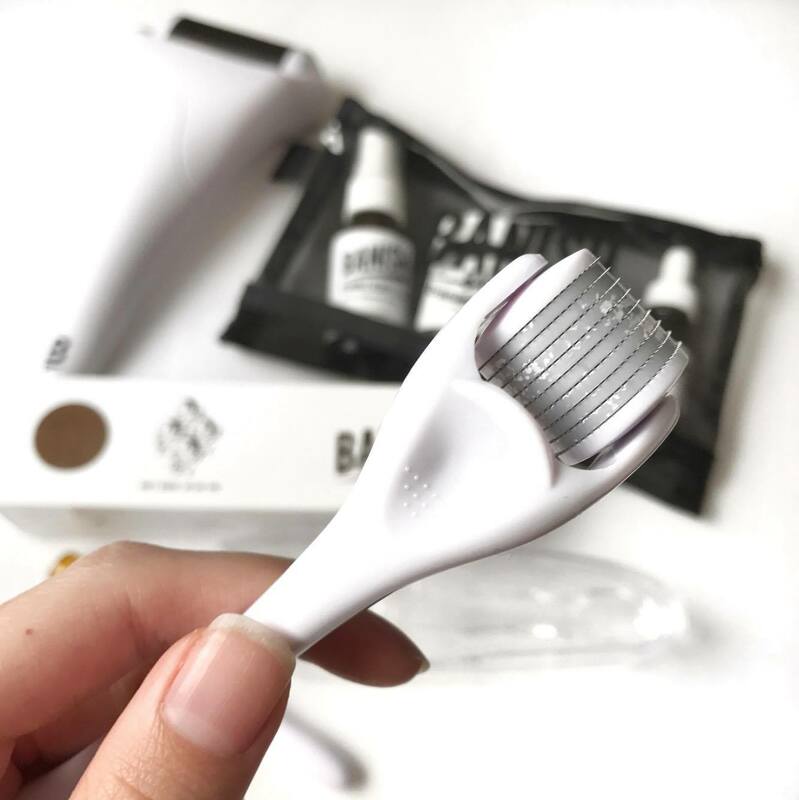 For those who don't know, derma rollers contain micro needles that stimulate collagen production to repair your skin, promotes the creation of new skin and increases blood circulation. Both the medium and pen banisher should be used on clean skin and only every two weeks. They should not be used over any active breakouts or acne as it can spread bacteria and infections! 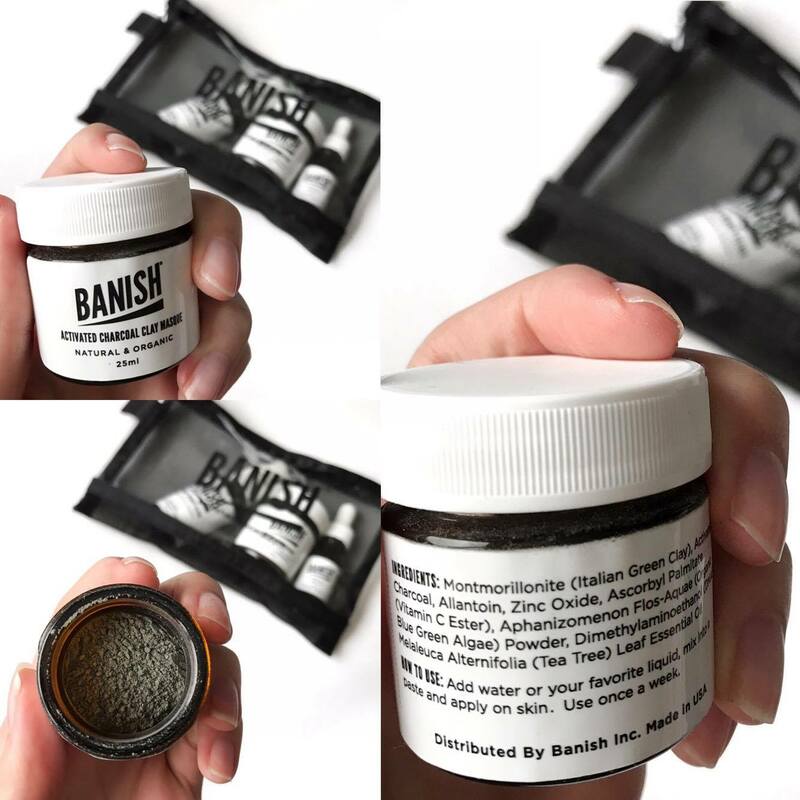 I found that the medium banisher worked well in clearing the texture of my acne scars, I no longer have bumps or raised marks on my skin but have a smooth surface with only the pigmentation left. I did not find it painful to use, it tickled more than it hurt, and I had minimal redness which did go down after a few hours (using the pore smasher or ice pack helped). I have only used the pen banisher once but I didn't find it as impressive as the medium banisher. It is good for people who have active acne as you can target scaring directly, I used this at a time when I had some breakouts. As you stamp your areas of scaring directly, I found it more painful than the roller, I did not press too hard yet still felt more pressure on my skin. I can't claim it wasn't as effective as the medium banisher but I felt I achieved better results with the medium. 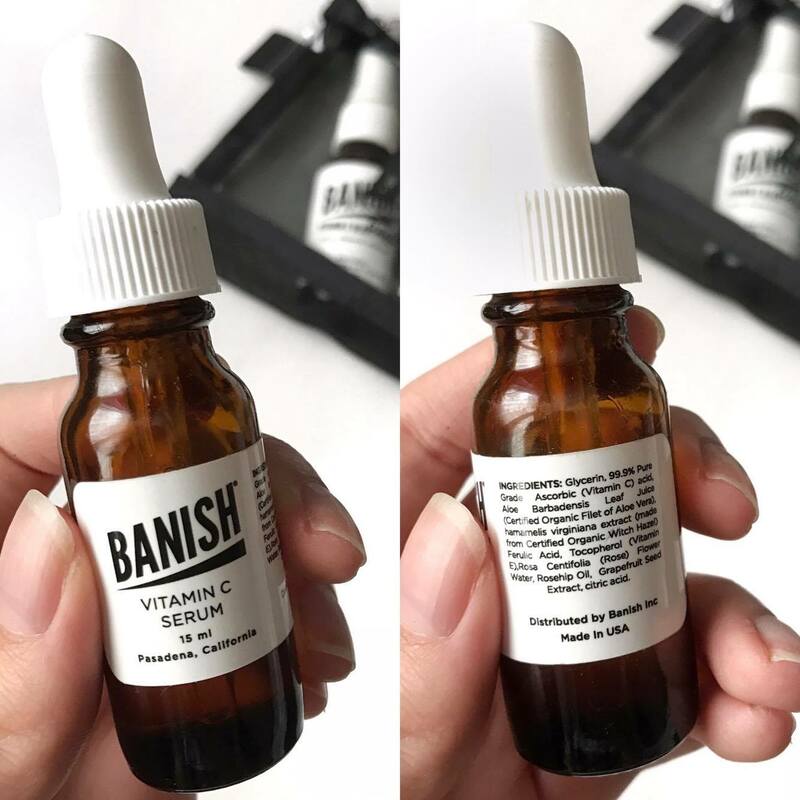 One of the products that is my absolute favourite is the vitamin c serum, I used this after derma rolling and every night without fail which has made my skin feel amazing. It has my my skin plump and hydrated and absorbs into the skin so well. This is one product that I would keep repurchasing! I did like using the Vitamin C Elixir, it refreshed my skin and added hydration and radiance. I have found other toners such as the Mario Badescu Facial Spray with Aloe Herbs and Rosewater (Beauty Bay-£7.50) and the Lush Tea Tree toner water (£8.50) that have made my skin feel the same way and had similar effects. 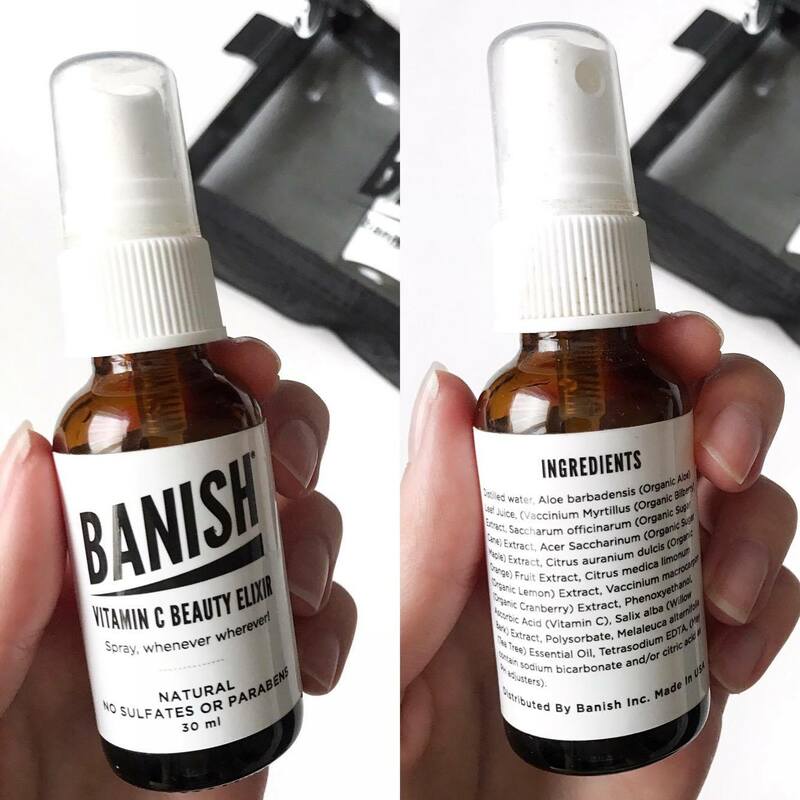 It is a fresh spray to use but I didn't see new results, I felt the Vitamin C serum was much more beneficial. The pore smasher has a detachable roll which you can put in your freezer for 20-30 minutes then attach to the handle and roll on your face. 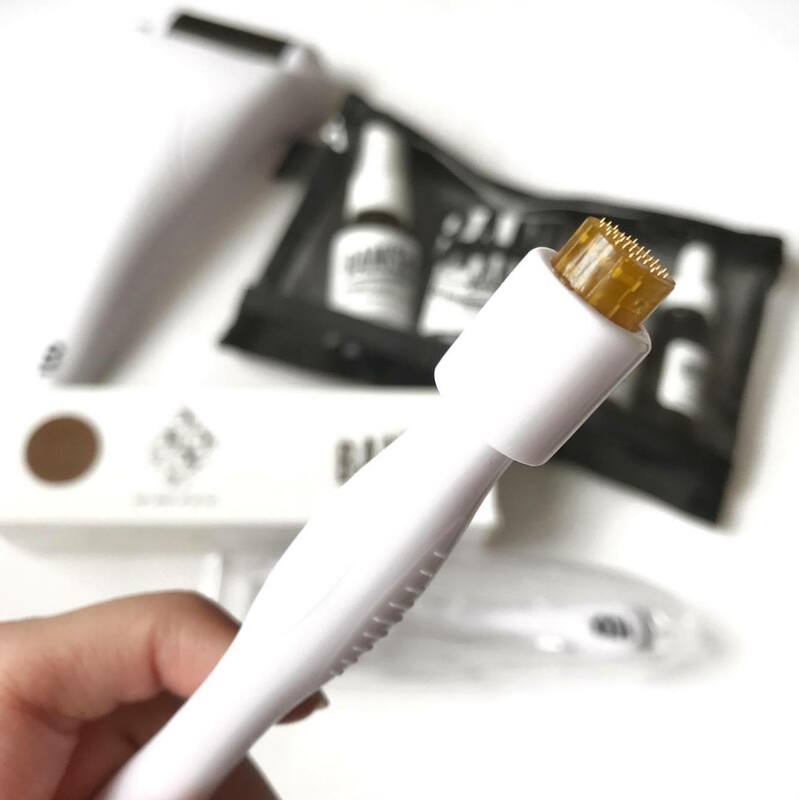 I previously used an ice pack on my face to reduce redness, close pores and cool my skin but this is a very convenient appliance to help achieve all the same results with half the hassle. The pumpkin enzyme mask was surprisingly one of the best masks I've tried (and I've tried a lot!). It is a very thick mask but you only need a thin layer so a little goes a long way. It has a very strong smell of pumpkin, which I don't particularly like, but the results are worth it. My skin feels extremely smooth and refreshed one I've used this mask and I found it helped with the pigmentation of my scars as it exfoliates away dead cells to renew your skin. The mask does tingle when applied but begins to subside as it dries, I enjoy the feeling knowing the mask is working! The charcoal and clay mask I found to be similar to many other charcoal/clay masks I've used. It was effective in drawing out dirt, impurities and blackheads making my skin feel fresh. One mask I use which is similar is the L'Oreal Paris Pure Clay Detox Mask (£7.99), I think they are both effective. One unique part of the mask is that it comes in a powder form so it stays fresher longer and you don't need to worry about the shelf life. You can mix the powder with water or your favourite serum/liquid so it absorbs deep into your skin. I used this mask with some water and the vitamin C beauty elixir to get optimal results. Throughout the process of trying to clear my skin, keep it clear and get rid of scars I've had many ups, downs and struggles. One thing I've had to learn is that my skin may not always be perfect but that's okay. I always thought as my face being the first thing that everyone sees, not everyone can have perfect skin and nobody should feel judged because of their skin. If you're struggling with your skin then I feel your pain and if you need someone to talk to feel free to drop me a message. 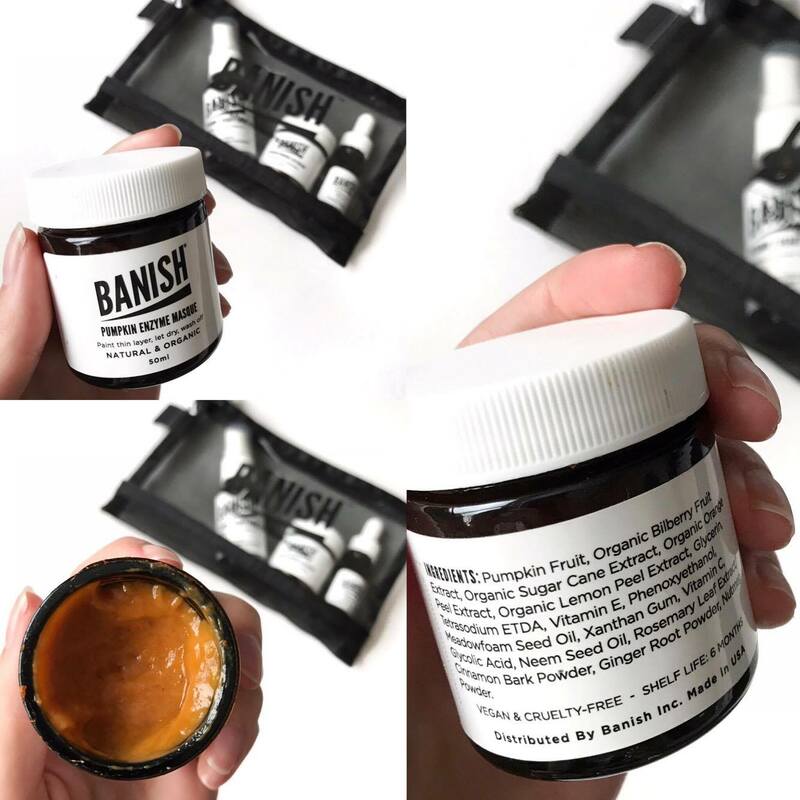 The creator of Banish, Daisy, has done an amazing job in creating this brand to help people clear their skin. A video I love from her channel is 'I AM NOT MY SKIN': https://www.youtube.com/watch?v=qbK3Zu6XNAE&t=11s. There are also many posts on the Banish Skin Care blog with tips to help you with your skin: https://www.banishacnescars.com/blogs/article. 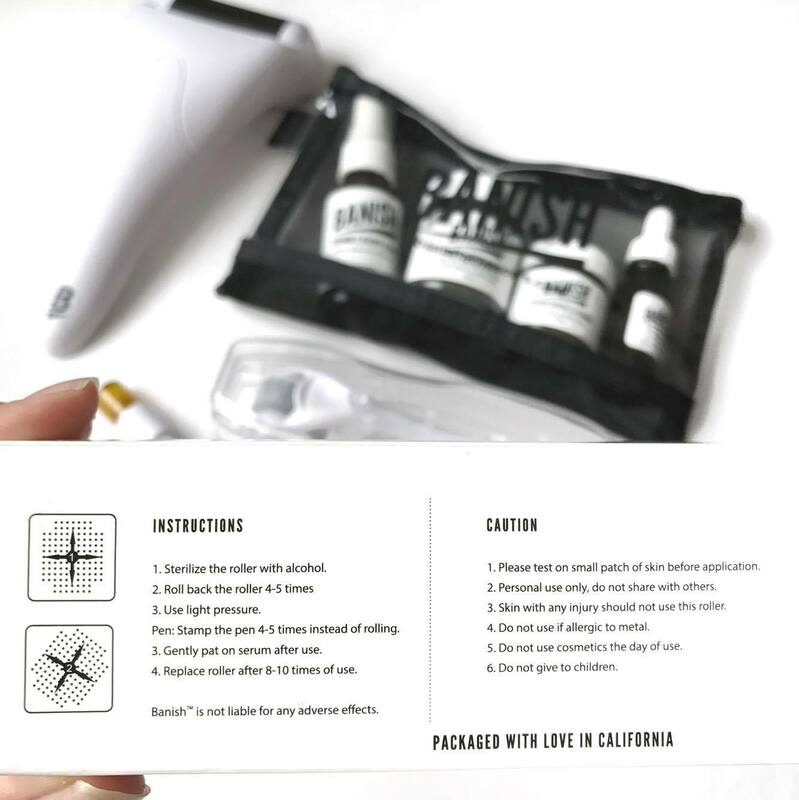 If you would like to purchase any of the products then you can from the Banish website: https://www.banishacnescars.com. There are offers to get some products as bundles and some of the items are reduced so grab them soon! Always remember you are not your skin!